When building our dream house we knew there were certain projects that we could handle and actually made sense, financially, for us to take on. Installing our interior doors (all 34 of them) was one of those projects. I’ve installed a prehung exterior door before and I’ve replaced an interior door slab but never installed a prehung interior door. So naturally I went to YouTube. Using some processes I found on there made my first door install take way to long and I couldn’t get it just right by myself. Jamie’s dad ended up calling on an old friend that was a trim carpenter and he gave me some tips. 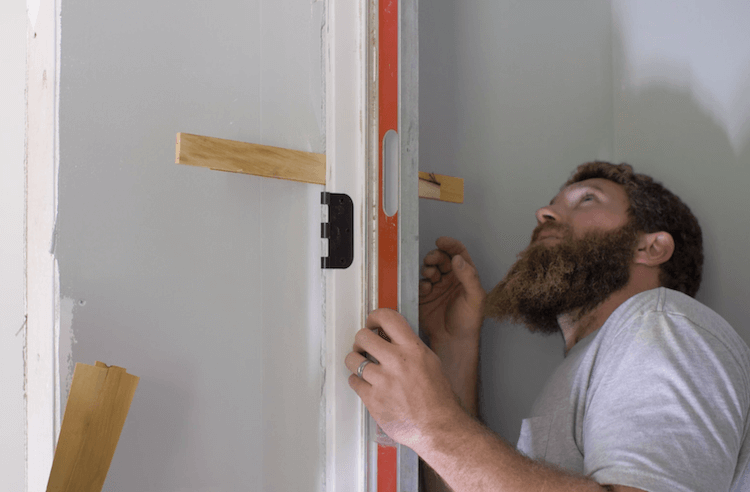 We quickly put together a fool proof method that allowed me to install a prehung door perfectly in less than 15 minutes. And surprisingly the brad nailer was what made this job so much easier. 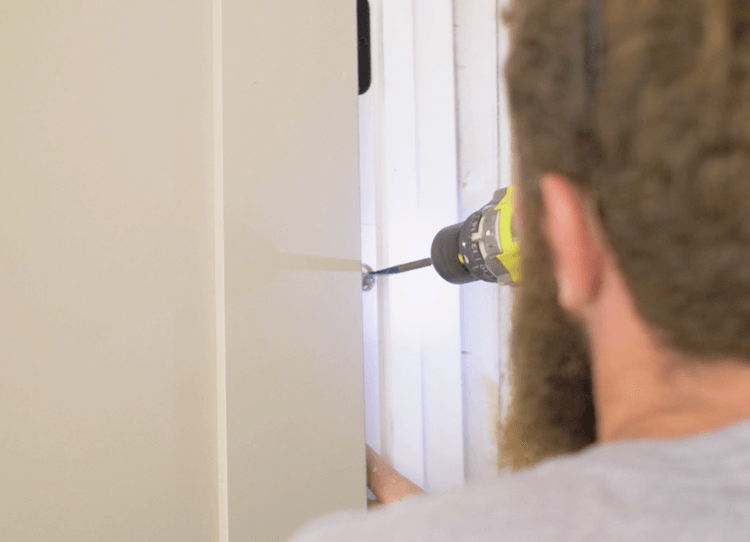 In this tutorial we go one step further and show how to “rough in” a jamb switch in the door frame. This is a great idea for closets because it acts like a refrigerator door light where the light comes on as the door opens and goes off when it is closed. 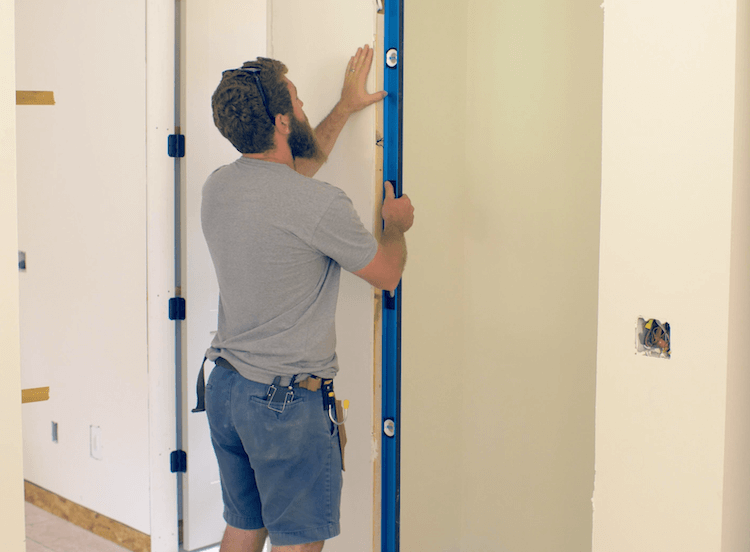 This process will allow you to install a prehung door by yourself in under 15 minutes. 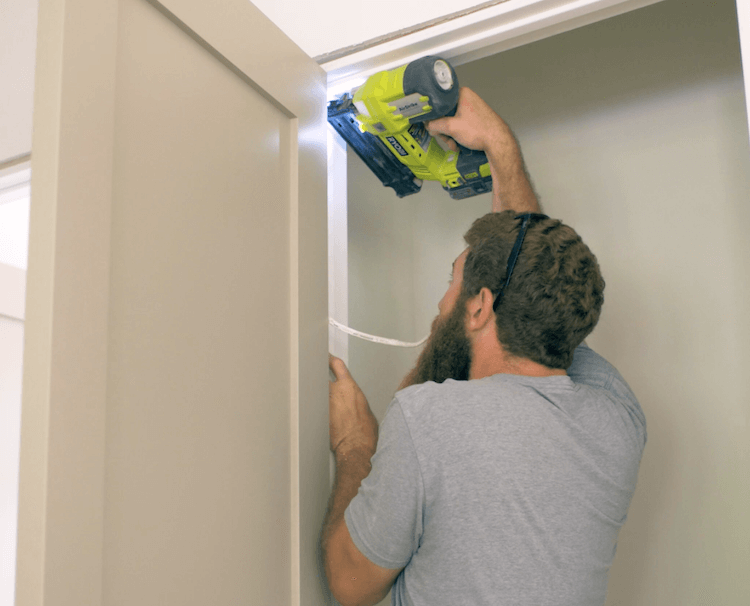 Mounting the jamb switch will add a little bit of time to the install but automating closet lights is well worth it. If you are not installing a jamb switch simply skip over step 2. With a 6ft level, check to make sure the jack stud on the hinge side of the door is plumb. 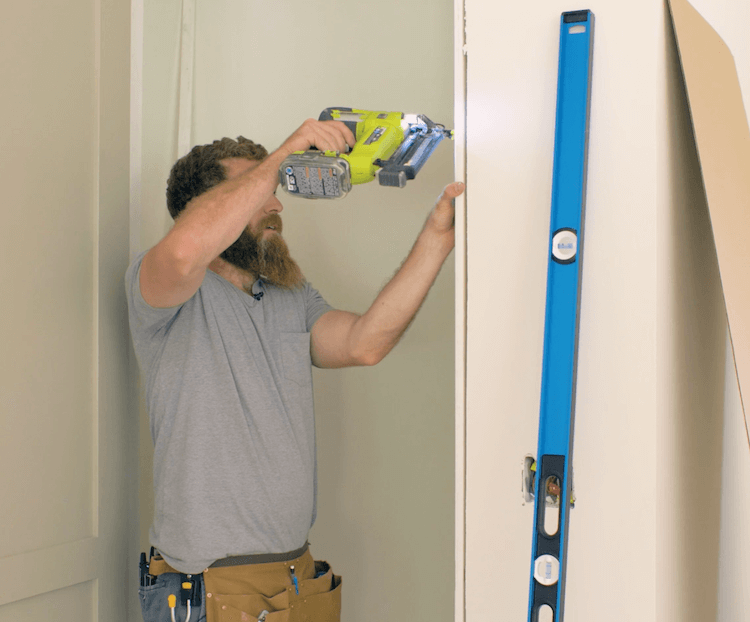 The jack stud is the interior stud of the door frame (one on each side) that supports the header. If it is not plumb you will need to shim out the hinge side so that it is. This process is as simple as placing a shim(s) between the level and jack stud until the level shows plumb. Then tacking the shim in place so you can set the frame up against it. Note: The photo below shows the frame with a shim behind it but I didn’t have any pictures of this process without the frame so you can ignore that. If it is plumb you can proceed with placing the door in the opening. 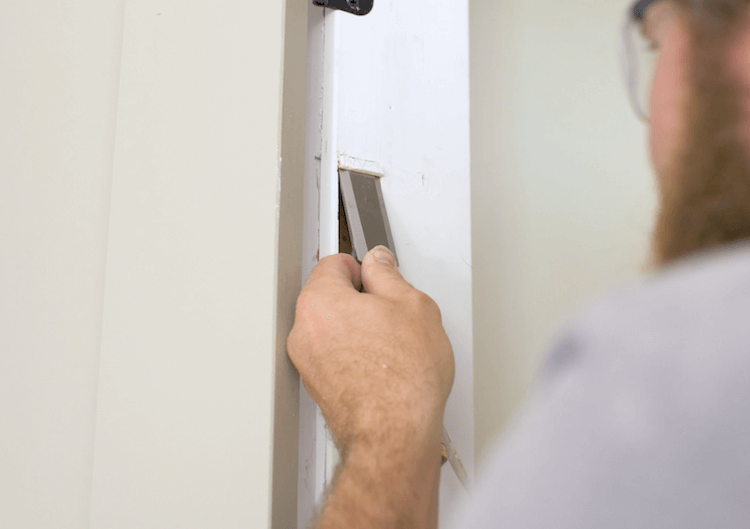 To reduce the risk of damaging the door or frame, keep the plastic piece that secures the door handle hole to the frame in place until you are about to slip it into place. Note: If you have already installed flooring you will need to trim the bottom of the door frame to match the existing door frame heights. 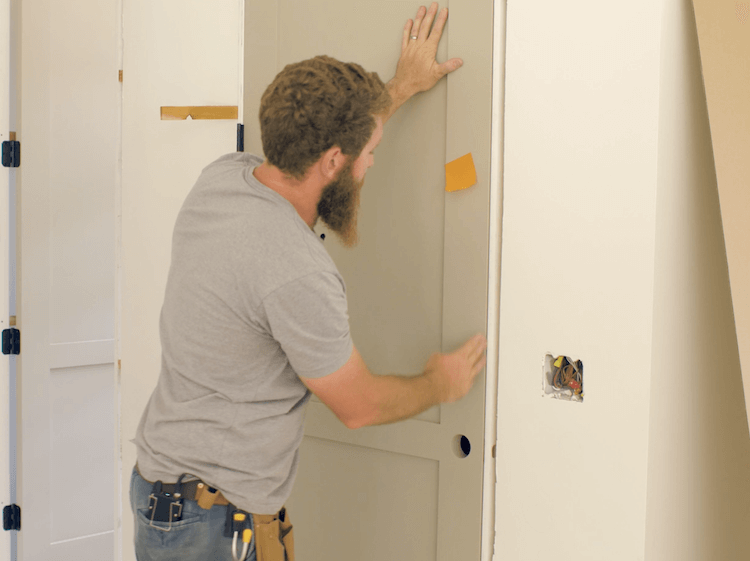 A jamb switch is an excellent idea for closet doors. This is a simple trigger that is installed in the jamb which interrupts the circuit when the button is depressed and turns the closet light off. When the door is open the spring-loaded button completes the circuit and turns the light on. 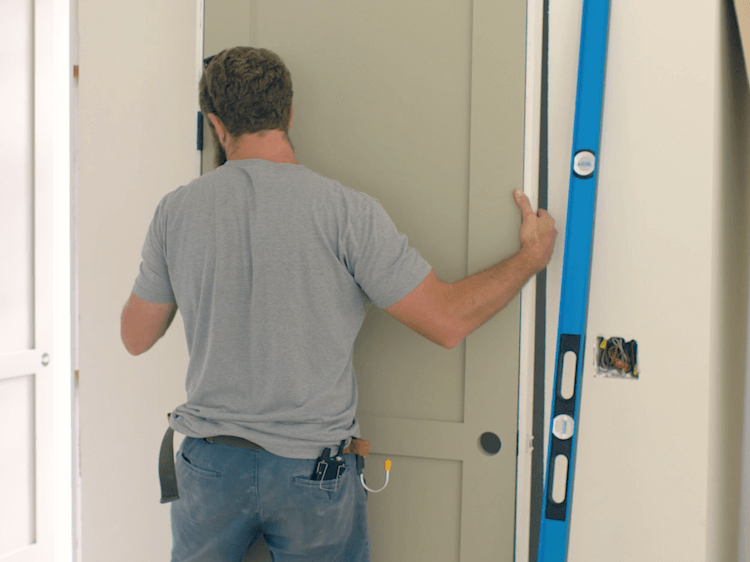 If you are not installing a jamb switch simply skip to the next step. With a jamb switch comes a matching electrical box. The jack stud will need to be notched out to accept this box. When I had the rough wiring ran by my electrician he cut the notch and had the wire there for me. I started by marking out where the box needed to go to match that notch in the jack stud and wire location. Then I slid the frame to the side and used a large diameter bit to drill a hole through. Then I pulled that wire through and cut out the hole for the box with a oscillating tool. Now I just needed to chisel out the top and bottom to allow a place for the flanges to recess into. After fishing the wire through the back of the box, I located the box and drilled pilot holes with a self-centering bit. Now the jamb switch is ready to be wired up but this will be one of the last things after trim and paint are done. Now it’s time to temporarily hold the frame in place. We will call this “parking”. 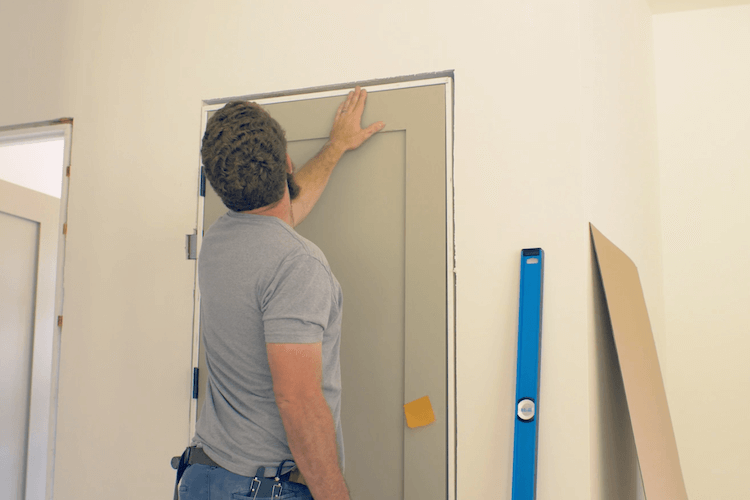 Start by flushing up the door jamb on the hinge side with the drywall. 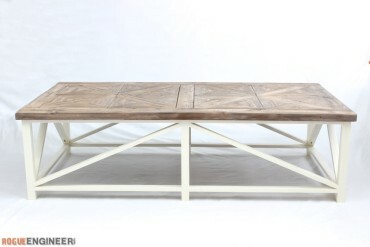 I like to use a speed square for this but any small straight edge will work. Do this all the way up the frame and on both sides of the door. Then “park” the hinge side of the door frame with 2 inch 18 gauge brad nails. These will temporarily hold the frame in place but still allow for minor adjustments. Do this on each side of the door stop at the top and the bottom of the frame. Check your reveal (gap between the door and the frame) across the top of the door. 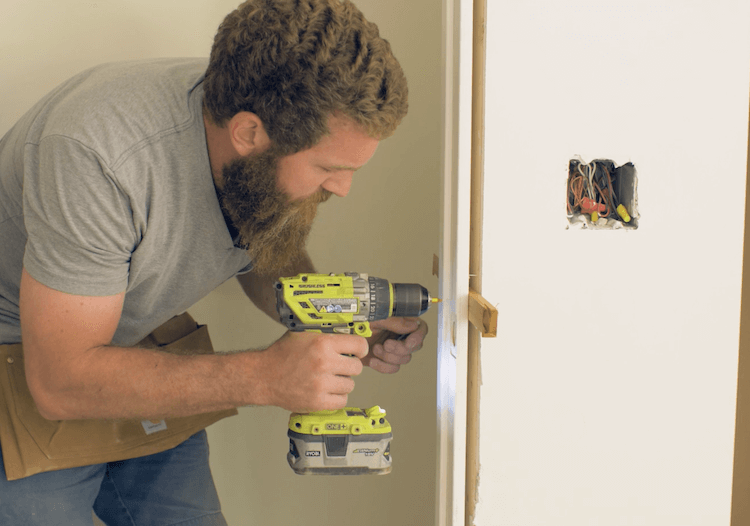 You want this reveal to be about an 1/8″ all around the door. Right now we will focus on the top. 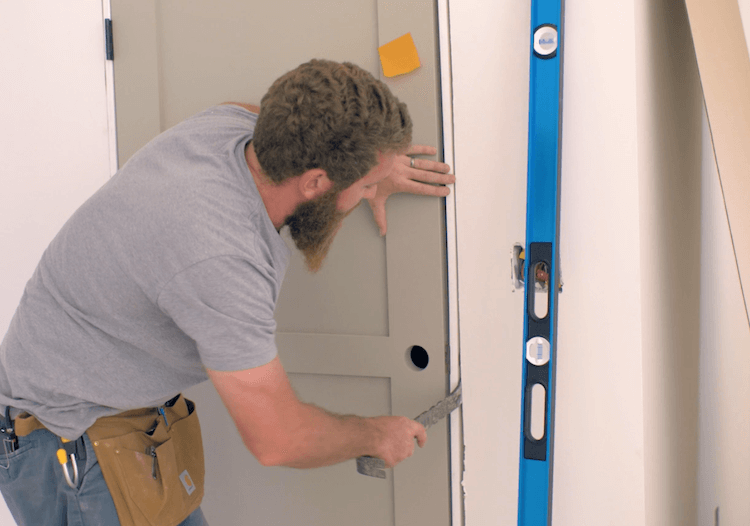 If the reveal is tight on the striker side then place a shim under the striker side of the door frame and adjust until the reveal is consistent. 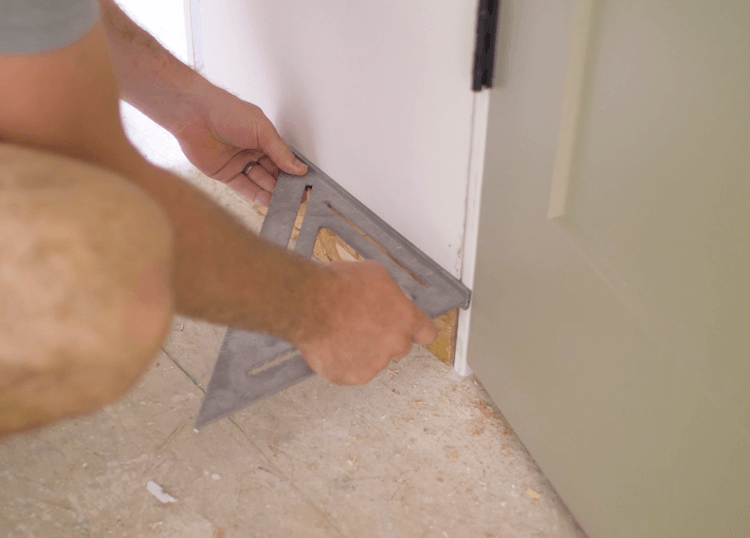 If the reveal is tight on the hinge side then wedge a shim under the door frame on that side (you may need to use a small pry bar) and adjust until the reveal is consistent. 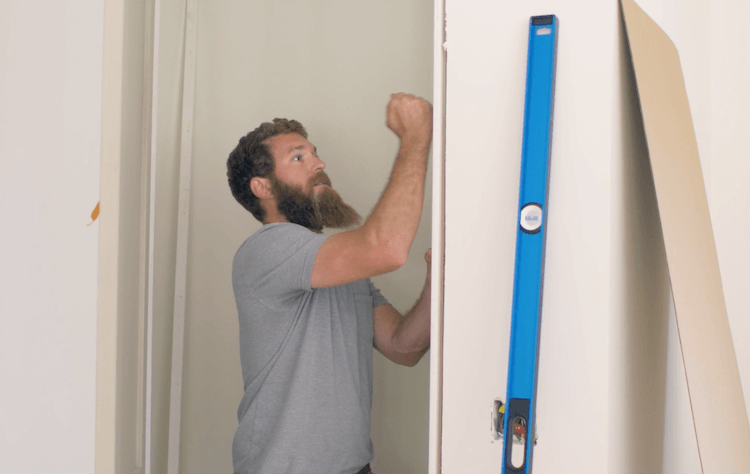 With a consistent reveal at the top and the frame flush with the drywall, you can now “park” the striker side with brad nails. On this side you will need to shoot the jamb with 3-4 sets of brad nails, evenly spaced (similar to hinge locations). These will be used to temporarily hold the frame in place and help fine-tune the reveals. Now it’s time to adjust for a consistent reveal. 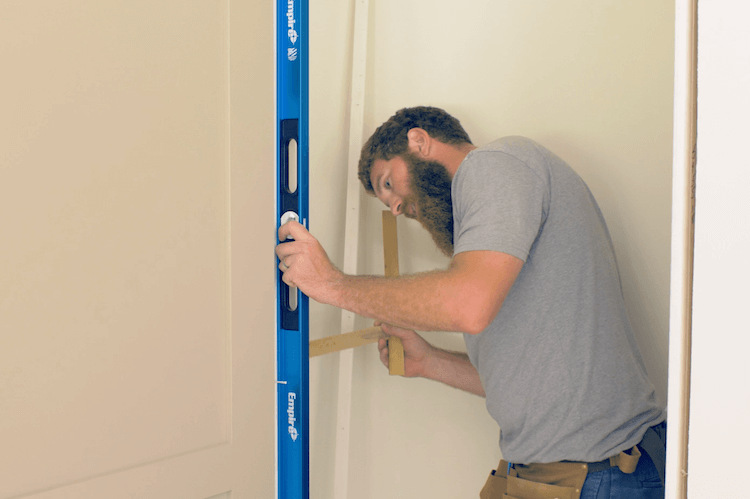 Using a flat pry bar you can easily get the door frame dialed in just right. If you end up prying it too tight to the door, simply open it up and tap it with your hand to get it right where you want it. If the reveal is too tight to the side at the very top, this is okay. It will be adjusted after the next step. 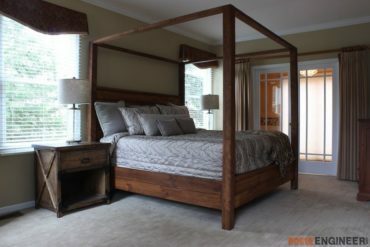 Place a 6ft level on the hinge side of the frame and check for any gaps of high spots. Shim if necessary to get the jamb side perfectly straight. Also assure the frame is square with the wall. You can do this using a square. The hinge side can now be secured with 2-1/2″ trim screws. I like the screws with the reverse threading at the top because you can “micro” adjust the frame location by backing out the screw slightly. 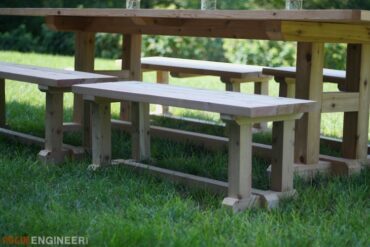 Place one on each side of the stop at each hinge location; above the top hinge and below the bottom hinge (above or below middle hinges is okay). If for some reason the top of the frame is too far to one side or the other, resulting in one of the reveals at the top of the sides being too tight, you can fix this now. To do so, shim the opposite side (side with too large of a gap) until this is corrected. By this you should be really close. Check your reveals again and adjust the frame to get them just where you want. 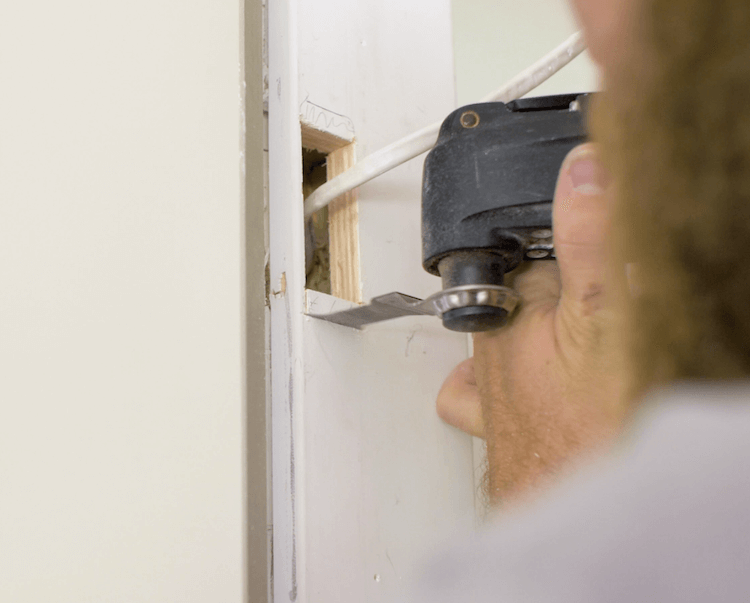 Place shims between the frame and the jack stud at each location that you plan to screw (similar to hinge locations) so that they are tight but not pushing the frame out. While shimming be sure to close it and check for a consistent reveal. 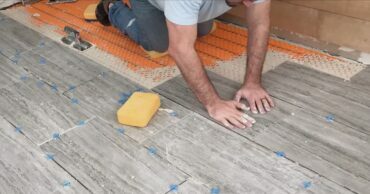 Once you have a consistent reveal and the shims in place, screw through the shims and into the jack stud. Check the reveals and adjust if needed. Then, score the shims with a utility knife and break them off. This completes the interior prehung door installation. Now all you need to do is add trim, paint and install the door hardware.